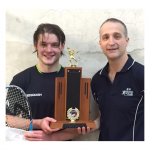 Masters Home Internationals – Dublin 1st – 2nd May 2015. Man Down! 10 days to go & the team plans shattered!!! A phone call from Robin Ridley to the team captain confirming his injury hasn’t & won’t clear up in time for next week’s internationals. A flurry of phone calls & a quick decision made by the team to ask the vastly experienced Peter Shivas to step forward for the jersey. Result!! Peter was available so the potential damage to the squad strength was limited as much as we could possibly have hoped for! With the squad of players coming from far & wide across the country we arrived in Dublin full of expectation at varying times prior to the team photographs at the extremely well appointed Fitzwilliam Lawn Tennis & Squash Club. First up at 5.15pm is Wales. Norman Patterson agreed to stand down for this match & we kicked off at No5 with Peter Shivas v Dave Sutherland. A relatively comfortable 3/0 win for the experienced Peter giving us good start in the match. 1/0 Scotland. The matches are played in 5,3,1,4, 2 order so that the no 1 strings play a meaningful rubber in the match, so next up was Neil Rayner at no3 v Paul Brennan. Neil was coasting to victory with all the usual trickery & racket skills that anyone that has played him has come to expect when at 2/0 with his opponent unable to cope with his disguised topspin drives & switch hitting we entered the 3rd with Neil looking totally in control. Disaster! Early in the 3rd Neil goes over on his ankle! After a few seconds to recover Neil carried on & managed to scrape over the line to win 3/0 possibly mainly due to his opponent not being able to read just about anything that Neil was doing. That could have been a lot worse!!! 2/0 the Scots. Next match on was new recruit Simon Gogolin at No1 v the very experienced Mark Davies. Simon eased his way into the match & won the 1st 9/5 in his usual efficient manner. The 2nd & 3rd were pretty much one way traffic as Simon really got into his stride to win them 9/1 9/1 for a 3/0 victory. Match over, a victory assured! With the match in the bag up Next team captain Dave Macca at no4 v Graham Jones. Dave had lost 3/1 to Graham 3 or 4 years ago in the Over 50’s internationals at Edinburgh so this had the look of a toughie. Dave scraped a nervy 10/8 1st game. Not exactly quality stuff with both players feeling the pressure (despite the fact the match was already won!). Jonesy eases through 9/2 in the 2nd. Game on! Dave managed to settle after the disappointing 2nd game to ease through 9/6 9/6 & grab a 3/1 reversal of the result at Edinburgh Sports Club. 4/0. Final match of the evening was 2nd string match Alan Thomson v Mark Johnson. The result was never really in doubt as Alan as usual moved the ball about with his usual amazing ease with Mark for the most part chasing shadows digging the ball out of the back corners then doing a full court sprint to the front to retrieve the softest of touch drops from Alan to the front. Although Mark was doing well and in the rally’s they were, inevitably it seemed, ending up with Alan winning the points as he floated to victory 9/1 9/4 9/0. 5/0 the Scots! An early start for this one after an (unusually) quiet Friday night for Scots boys in Dublin. Bad news to start the day!! Neil Rayners ankle injury has worsened overnight & he has declared himself unfit to play for the remaining matches. Not ideal but better that than starting a match & having to concede. Norman Patterson kicks off against the host nation at No 5 v Michael Mulhall. Bang! Norman is out of the traps like a shot winning the 1st 9/1. Michael doesn’t seem to know what’s happening, however he is an experienced campaigner & gradually works his way into the 2nd game squeezing it 10/8. Norman regroups to win the 3rd 9/3 & he’s back on track. Michael isn’t about to give up without a fight though & again with a massive effort captures the 4th 9/7. 2/2. Michael’s efforts seem to take their toll on him in the 5th with Norman the stronger of the two takes the decider 9/3. The visitors 1/0 up! Number 3’s up next. Captain Macca v Dave Lalor. Dave Lalor’s flicky style & chipped drop & lob approach seemed to suit the Scotsman who seemed to be a bit more relaxed than the previous evening moving to a relatively straightforward 9/1 9/6 9/2 victory. With the match standing at 2/0 to Scotland the next match was a biggie for both teams. It would either keep Ireland in the match or secure a guaranteed victory for the Scots. From our point of view it was comforting to know that at No1 we had Simon Gogolin former World Masters runner up so it looked like a tough ask for the Irish No1 Martin McDonnell. It proved to be the case with Simon growing stronger the longer the match went on with Martin putting up a good fight in the 1st to lose it 9/5 but seeming to accept that Simon was just too strong the longer the match went on to lose the next 2 games 9/2 9/0. The victory was sealed 3 matches to love! Peter Shivas stepped on court at No4 v Michael Conlon & stamped his authority on the game right away with a 9/0 in the 1st. Things didn’t get much better for Michael as Peter eased his way to 2/0 with a silky 9/3 in the second game. A bit of a mixture of Peter coming off the gas slightly & Michael trying extra hard to get a foothold in the match saw him squeeze the 3rd 9/8 after calling 1 at 8all. Peter seemed to take control again in the 5th with Michael looking a bit weary allowing the Wishaw man to tie it up 9/6 in the 4th. Last on in a dead rubber was Alan Thomson at No 2 v Donal Coughlan in probably the match with the most bizarre score line of the weekend. Alan won 3/1 not dropping a single point in the games he won! However Donal made a massive effort in the 2nd winning it 9/5 but seeming to blow up after winning it. Alan wins 9/0 5/9 9/0 9/0! Match to Scotland 5/0. Following a bite of lunch both teams gathered for the decider. The atmosphere was suitably tense with us feeling we had a real chance of taking the over 55’s title. What an amazing opportunity! The Scottish team discussion over lunch largely centred around the fact that Simon at 1 really fancied his chances against Dermot Hurford. Alan Thomson had also apparently never lost to the Englishman playing at 2! This left us with wondering where we could possibly squeeze another rubber out of the match to defeat a very strong England squad on paper and admittedly they looked a bit worried at the onset of the match. The no 5’s took to the court & Norman Paterson seemed to have his work cut out against Ian Bradburn though rumour had it Ian wasn’t at his best after some time out following ankle surgery. He looked not too bad to me blasting Norman 9/0 in the first and 9/2 in the 2nd! However fair play to Norman who seemed to be slowly coming to terms with the ferocious power of Bradburn, twisting & turning him in the 3rd to take it 9/5. Ian didn’t look to be moving at his best and Norman was getting shots back that Ian wasn’t expecting. Into the 4th & unfortunately Norman couldn’t keep the ball tight enough & the main strength of Ian is his ability to crunch the ball away for a winner given any sort of opening. 3/1 Ian 9/2 in the 4th. England ahead 1/0. No3 Strings next with David McAleese lining up against the North East’s Neil Harrison. Dave knew he had a bit of a task on his hands as Neil managed to beat Simon Gogolin 3/1 in the British Championships in Manchester in February on his way to the semis and he had looked to be playing well all weekend. Neil played at a furious pace and managed to stay ahead, albeit narrowly in the first 2, in all 3 games to win 3/0 9/5 9/7 9/3. England 2 matches to nil! Not to worry still 3 matches to go we might still nick it! Simon Gogolin v Dermot Hurford at No 1 string had the look of an epic match. Dermot was runner up in this year’s British Over 55 Championship in an event that Simon was No1 seed. The first game was quite a contest with Simon hitting good length & combining them with touch drops and boasts. Dermot was moving like a Rolls Royce as usual and was on the ball in a flash letting Simon know that he had a job on his hands. Dermot steals the 1st 9/7. Simon began to look a bit out of sorts in the 2nd and Dermot eased through 9/2….things not looking quite so positive for us now at 2 matches to love down and 2/0 down in this one! Our hopes were dashed when despite Simon putting up a fight Dermot didn’t let up and took the 3rd 9/4. Match over 3/0 England to their relief and our great disappointment. You might think that win the match in the bag for England the last two matches being dead rubbers would be a bit of a non event but not a bit of it. Old rivalries run very deep between Scotland & England as I am sure everybody knows and this proved to be the case with the last 2 matches both going the full distance to 5. Peter Shivas v Mark Taylor at No4 string was an enthralling battle with Peter moving the ball about with his usual precision, switching, holding & hitting, delay & deception and Mark bouncing about all over the shop like a jack in the box. The result of this one was in doubt right to the end but Mark lased the course in a 3/9 9/3 10/8 10/9 9/5 victory. 4/0 England. The last match of the day was Alan Thomson v Jeremy Goulding at No2 at least the odds were in our favour in this one? Alan started well lobbing & dropping Jeremy, keeping the ball tight & squeezing errors from Jeremy who seemed to be struggling with Alan’s unique style. Alan moves to 2/0 up with 9/3 10/8 games. Jeremy started well in the 3rd, probably trying extra hard to get something out of the match nicking it 9/5. He seemed to be moving a bit better now keeping it tighter and taking his chances. Into the 4th with both player realising the importance of it (at least in this rubber if not the match outcome!) see sawing back & forward until they reached 8/8 setting to 2. With Alan at match ball Jeremy plays a forehand down the wall & doesn’t clear very well as Alan is on him in a flash! “Let Pleeeeeeeeeeeeeeesssssssse?” shouts Alan who obviously had made up his mind what the decision was going to be and stretches his hand out to Jeremy expecting to hear the phrase “Stroke to Scotland!” The call doesn’t come as the ref sees the situation (which could have gone either way) as a let! Alan is a touch upset & loses the 4th 10/9. Alan seemed to lack focus in the 5th, looking as though he can’t believe the match is still live, as Jeremy moves to a 3/2 victory 9/4. 5/0 England. What seemed to be a big chance at lunchtime didn’t come to pass but the thought that we could win it was great while it lasted! Soundly beaten in the end by a strong England side boasting the British Over 55 Championship runner up & both losing semi finalists in it. Still 2nd place in the Home Internationals away in Dublin is no mean feat. Onwards to the presentation dinner and Disco with Pauline Douglas as usual taking no notice that the men had played 2 epic matches that day proceeding to dance the feet off everybody! Many thanks to Fitzwilliam Club and Irish Squash for hosting such a memorable weekend! 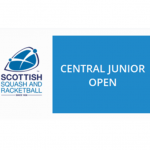 Central Junior Open – Closing date extended Kempsell Wins Down Under!